The chair of the Jewish Federation of Greater Vancouver is demanding TransLink take down controversial ads relating to the Israeli-Palestinian conflict. The ads, titled "Disappearing Palestine," feature four maps showing the Palestinian territories shrinking into the state of Israel over the last six decades. 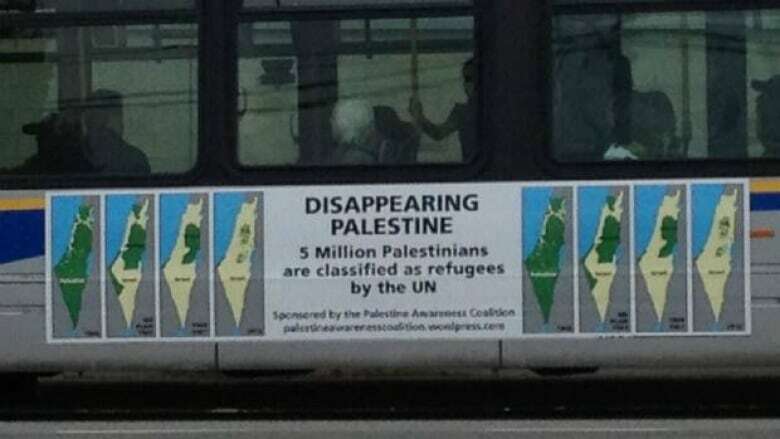 The posters, produced and funded by the Palestine Awareness Coalition, appear on about a dozen buses and in the City Centre SkyTrain station. The federation's Mitchell Gropper said his group met with TransLink several times to convey their concerns, but the ads went up anyway. "What is of real concern to us, now that these ads have been displayed, is that TransLink is allowing the use of its vehicles to create disharmony and disunity in our society, which is very disturbing," Gropper said . In a news release, TransLink said its advertising policy cannot violate freedom of expression under the Canadian Charter of Rights and Freedoms. Gropper, also a lawyer, said he and his community believe in free speech, but there are limits. Free speech "is not without limits," he said. " You cannot use free speech to libel and slander others, you can not use free speech to endanger other groups." TransLink said the Disappearing Palestine ad was referred to the Canadian Advertising Standards office for review before being given the go ahead. TransLink said it also sought a third party legal opinion on the matter. The Palestine Awareness Coalition could not be reached for comment.